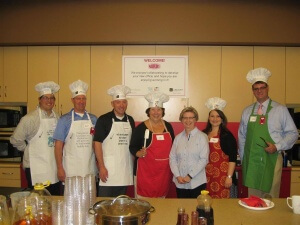 Mohagen | Hansen Architectural Group, along with partners Greiner Construction and Henricksen, strapped on their chefs hats and aprons to serve pancakes like the pros to the Hawkins Chemical employees to celebrate their new office space! As our first ever pankcake breakfast, the event was a hit! Mohagen | Hansen had a great time celebrating with Hawkins and our project partners. We are looking forward to many more pancake breakfast celebrations with our future clients! Please visit our website to view photographs of the new Hawkins office space.